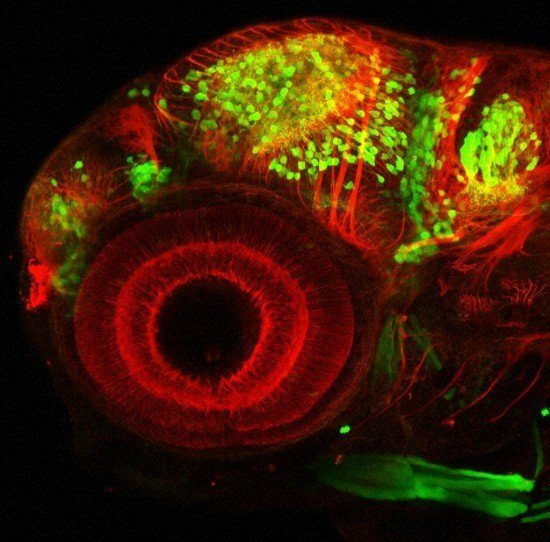 Confocal micrograph of the head region of a transgenic zebrafish embryo. The large circular structure is the eye, showing the structure of the retina. Some neurons in the brain are highlighted in green by GFP expressed under the control of the specific promoter Dlx4/6. The DLX proteins are postulated to play a role in forebrain and facial development. Therefore, the GFP is only “switched on” in developing neurons that require this gene. The microtubules in neuronal processes have been labelled using an antibody for tubulin (red). This image (www.cellimagelibrary.org/images/39027) is by Monica Folgueira and Steve Wilson and is licensed under a Creative Commons Attribution, Non-Commercial, No Derivatives License. Looking for new ways to stay up to date with the Cell Image Library? Check us out on Instagram at cell_image_library. Whether you are looking for that one perfect example for a lecture or a big data set to analyze, we can help. Use our Advanced Search to help pinpoint exactly what you are looking for or check out the Data Sets tab at the Cell Image Library to find our large data sets, including the Human U2OS cells—compound cell-painting experiment, which contains over five million images. Even if you do not have millions of images, we can help you with your Data Management Plan (DMP). Be sure to contact us before submitting your grant application so we can help with your DMP for your cellular images. The Cell Image Library (www.cellimagelibrary.org) is a freely accessible, easy-to-search, public repository of reviewed and annotated images, videos, and animations of cells. Portions of the Cell Image Library were developed by ASCB under a Grand Opportunities grant from the National Institute of General Medical Sciences and are now managed by the National Center for Microscopy and Imaging Research under a perpetual license from ASCB.